The Corrs are a folk pop band from Dundalk, Ireland, consisting of three sisters and one brother from the Corr family, who rose to prominence in the late 1990s and have since sold more than 55 million albums worldwide. 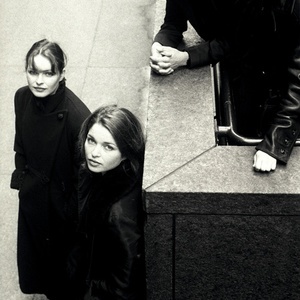 The band consists of siblings Jim Corr (keyboard, guitar, backing vocals, born July 31, 1964), Sharon Corr (violin, backing vocals, born March 24, 1970), Caroline Corr (drums, bodhran, piano, backing vocals, born March 17, 1973) and Andrea Corr (lead vocals, tin whistle, born May 17, 1974). They released their first album Forgiven, Not Forgotten in 1995, which had its greatest success in Australia, Sweden, Spain and Ireland, gaining later success in the UK and in Canada. The title track, 'The Right Time' and 'Runaway' were all singles that would reach within the top ten Irish Singles Chart. Success followed in much of Europe, Asia and Australia. Two years later in 1997 a second album Talk On Corners was released which was principally popular in Ireland, eventually raising them to astonishing fame in the UK, and later success followed in much of Europe, Asia and Australia. Both albums have been certified gold in the United States. In 1999, they recorded a Unplugged album as part of MTV's Unplugged series. The session was recorded live on 5 October 1999 in front of an audience at Ardmore Studios, Co. Wicklow, Ireland. In 2000, following the death of their mother, Jean, in 1999, they released their third studio album In Blue, which included the song 'No More Cry' which Andrea, the lead vocalist along with Caroline the drummer, wrote after the loss of their mother. The hit song 'Breathless' from this album also allowed the band to break into the U.S. The band took a break after this, allowing time for Sharon Corr to get married, and Caroline Corr to marry and have her first child, a son, Jake. A compilation album The Best of the Corrs was released in 2001 featuring previous released songs as well as new tracks. The new single that was only released and featured in this complication is 'Would You Be Happier'. After six months from the album's release, it turned multi-platinum worldwide. Selling just over 17 million copies worldwide, it is The Corrs' most successful album to date; and one of the most succesful albums to come out of Ireland. Andrea Corr also began to flirt with the possibility of acting. After appearing in several movies such as Evita, Boys and Girls from County Claire, and The Bridge. In 2004, they released their album Borrowed Heaven, which featured the track 'Time Enough For Tears' which was penned by Bono and Gavin Friday for the film soundtrack In America, as well as Lady Smith Black Mambazo featuring on the title track. The album was a great success in their homeland Ireland where it peaked at number 1 with all three singles entering the Irish Music Charts. The album also entered the top ten albums in the United States with the single Summer Sunshine entering the top 20 singles. Around this time also, Caroline gave birth to her second child, a daughter, Georgina and now it is said that another baby girl is on the way. Following this album a year later, the band covered several traditional Irish songs and traditionals on the album simply named "Home". "Home" was compiled through a songbook of their late mother Jean Corr as a tribute to her. Following the album release of Home, Sharon has given birth to her first child, a son, Cathal, and Jim Corr announced his engagement to his girlfriend Gayle. They have a son, Brandon. Andrea is currently working on several film projects and is planning to embark on a solo career, whilst her brother and sisters focus on their families. Her forthcoming solo album is titled "Present" and is produced by Nellee Hooper. Bono is the executive producer of the allbum, which should be out in Spring '07. The band are due to release another Greatest Hits album on the 20th of November 2006, entitled Dreams: The Ultimate Corrs Collection. Andrea Corr also has acting ambitions. Long before The Corrs made a record, she played a small role in The Commitments (1991), as Sharon Rabbitte, one of the lead's younger sister. She is seen dancing the jig in one of the band casting scenes. She also played in Evita (1996) alongside Madonna as one of president P?ron's mistresses, in Broken Thread (2007), The Bridge (2005), The Boys from County Clare (2003), and sang the part of Kayley in Quest for Camelot (1998).